Oh my GOODNESS! I can't keep from cracking up each and every time she pulls this on me. It happens anytime I attempt to correct her, make her work on therapy, or put her into her bed. She can't be serious, can she? This face is too adorable to convince this mommy that life is really all that bad. I'm sure this lip is bringing back an image or two for my own parents. What Ashley Kate doesn't know is that her mommy was the master at pulling the "lip" in my younger years, and I'm sure if you ask Dave he might tell you that even he has seen me try it a time or two. Extra! Extra! Read All About Her! To be here in our home tonight, all together, all ready for bed. I am grateful. As I learn of another family who has been given that terminal diagnosis that without a bowel transplant there is nothing more that can be done for their child and as I understand the struggle and fears those parents(who I will never meet) are facing as they try and decide if this is the road they are supposed to travel. I am grateful. For our donor, our organs, our journey, our homecoming, our life. She is home and she is alive 21 months after her transplant. I am grateful. As I read of a sweet four year old baby who remains living away from home a full year after her transplant and I hear the longing for home in her mommy's words and feel the hurt and the frustration she is experiencing. I am grateful. My heart has been so changed. I carry burdens for those I will never meet and I cry tears for them because of the compassion we have been given from so many who have never met us. I pray for them like I know them and I long for good news to come to them. I am grateful. It is long and tough and the road goes up and down again and again and again, but underneath each obstacle you will find a heart of gratitude and thanksgiving. I am grateful. Ashley Kathrine Adams. I am grateful for her. I am grateful for it all. Each and every moment of this amazing journey. I am grateful. Its never been easy and I don't think it ever will be, but HOW grateful I am to be the one doing it with her. I love being her mom. I am grateful to have been changed. Its 4:15 in the morning and I'm wide awake. My mind is cluttered with thoughts of conversation had between Dave and I as we sat across from each other in a restaurant last night. It seems that each time we slip away together to talk our conversations always fall on the subject of our youngest daughter. This evening was no different. It included smiles and laughter over her silliness, praise and worship over her zest for living and the miracle that she is in fact living, and tears mixed with silence over her delays and disabilities. We discussed more ideas and searched ourselves for more options in how we should proceed with teaching her to be...what? The right words escape me. All that she can be? That sounds ridiculous to me. The best she can be? I think she's pretty great right now. What should I say to finish that sentence? I don't know. I just know that we have to keep figuring out ways to teach her more and more and more. It doesn't feel right to settle in and just accept that she doesn't talk or walk or really eat. Why doesn't she do these things? There are no answers that have been found. We discussed more therapies. There was a point when we had her days and ours filled with therapy sessions and this person and that coming in to work with her. It yielded little to no result. Basically all we accomplished was making everyone miserable. Ashley Kate and the therapists alike. Is this where we need to go again? Is this what we are supposed to be doing? Neither of us think it really is. At this time she has physical therapy each week and we continue to work on her ability to move. This has been her most successful therapy to date and I wonder if its because of our relationship with her therapist that makes it more successful than the others? Her therapist has a relationship with us and had before the birth of Ashley and I truly believe that she loves Ash and nothing Ashley "says" or "does" could run her off. Our other attempts at different therapies have not been successful. We tried occupational. There evaluation of Ashley is that she has fine motor skills down. She doesn't really need help figuring out the little things. Its the big ones like rolling, crawling, standing, walking that she can't seem to do. They thought that Ashley's biggest problem was trust and understandably so. Occupational didn't seem the way to go. Speech? We all know she doesn't talk, but therapy was yielding no results. We have tried it at several different points in Ash's life and it has never done anything for her. The biggest thing we have learned is that when she speaks she will more than likely begin to eat as well or vise versa. The same muscles are used for both skills and they kind of go hand in hand. Feeding therapy? Well, lets just say that our therapist agreed that I make more progress with her than we ever did each week with her therapy. There were no "tricks" that were taught to teaching Ash to open up and eat. I was hoping for some, but we basically did what I had been doing her whole life and what I have continued to do. So is more therapy the answer? We went back and forth and back and forth and decided that we've been there and done that. Neurology? Do we go back to getting ourselves on the waiting list to have her seen and diagnosed? and what good would a diagnosis do for her? Can it "fix" what is wrong? or would it only place her in a box and slap a label on her? We sat on the waiting list for months and months when they were concerned with the possibility that the cancer had moved into her brain and spinal fluids. Eventually she got sick and had to be hospitalized during that wait and we kind of fell of the list. Honestly, we aren't interested in any labels for her and even though the idea comes up every now and it doesn't seem like neurology holds the key. So as tears fell from my eyes last night these words came from my broken heart, "I never imagined she wouldn't be able to talk or walk. Did you?" His reply was this, "Nope. Eat a steak with me one day? I never felt like that would be a possibility, but talking and walking never really came to mind. I just figured she would." Then he shared this. Earlier that day he ran into a parent who faces some similar struggles as we do and as they visited the other dad said something about glimmers. Glimmers of hope that come slowly but can be held on to and thats what keeps them going. Slow progress but still progress. As he shared his conversation with me I sat and silently cried as I nodded my head. Dave shared with me all the progress he sees with our Ashley Kate and we sat at the table and went through the list. She can sit up. For hours and hours she sits and plays. This is a glimmer of hope in our world. There was a time when sitting seemed impossible for her. She can drink. From a cup. She holds the cup and swallows the water with no trouble. I'll never forget how excited we were the day she picked up that silly cup and drank from it. We worked for what seemed like forever to get her to do that. This is another glimmer of hope in our world. If she can pick up her cup then someday she may pick up her spoon. She can giggle. She has a voice. It has not been silenced. With this voice she may speak words again. Someday. This is my biggest glimmer of hope when it comes to her ability to talk. I know she wants to be heard. She can sign. Everyday she learns more and more words. Until the day that she learns to speak with her voice she can communicate with her hands. When I wonder about her level of thinking ability this puts my mind at ease. Glimmers. She is so intelligent and capable of learning new things. She can play. Give Ashley Kate a new toy with buttons to work or pieces to use and show her how and then watch over the next few minutes as she figures it all out. Day after day I see glimmers of her mental ability. She can bite. A cracker, not us. That is huge. Until a few weeks ago she had never used her teeth or her hands in conjunction with each other. The day she held the cheez it to her mouth and used her teeth to take a bit was HUGE. It glimmered with possibility. I believe she will learn to eat someday. She really will. She can remember. Ashley Kate remembers where each and every lift a flap or touch and feel spot is in every single book she has. Show her a new book and watch her little hands turn each page and feel it from top to bottom looking for new textures or hidden flaps to open. Unprompted she automatically looks. She shines in this area and always has. The fact that this one thing has never changed throughout all she has been through glimmers with possibility. Her brain has held on to this one piece of knowledge even though she endured cardiac arrest, chemotherapy, and multiple periods of time on the ventilator. She loves. Her family so very much. My heart smiles at this fact. She gives and receives love. Ask her for a hug and she leans herself into you and pats you with her little hands. I say the word "I" and lean my head toward her and she automatically leans her forehead to mine and shakes it back and forth as I say, "I love you, love you, love you." She snuggles her head into my neck and rests there for a moment every single time I pick her up. She is comforted by our presence and our touches. Blake and Al can settle her in an instant when they walk into the room and speak to her or pick her up. She loves to be with them and this glimmers brighter than any of the other abilities she has. Making decisions for her present and her future are things that we have to do. I would love to ignore the facts and pretend that all is right, but that would be irresponsible. I have to figure out how to be not only her mommy but her teacher as well. This week we will begin a new set of activities. Flash cards. Big huge flash cards that I used to teach Blake and Allie their colors and their shapes with. Ashley Kate is almost three and she is smart. She can learn things too. It may take us longer than it did with the other two, but I am willing to work on card at a time for as long as it takes. Its all just fun to her anyway. Playtime with mommy. She loves for one of us to be on the floor "playing" with her at all times. She may not speak yet, but she can point, she can choose, and she can sign. Glimmers. Hopes and dreams glimmer inside of my heart. They aren't really dead they are just changed. Altered a little. Different than what I had initially thought they would be. I'm clinging to them and not letting go. As Ashley Kate lays sleeping in front of me this afternoon I find myself still amazed. At her beauty. Her strength. Her features. Her spirit. Her sweetness. Her stubborn streak. Her joy. Her presence. Her place in our home. I don't think I will ever get over the feeling of being the most blessed mom in the world. She was handed to me. Of all the amazing moms in this world He chose to trust me with this little girl and the overwhelming sense of awe I feel because she is here with us never gets old. We are blessed and humbled. Thank you Lord for her life and all that she adds to our family and our home. Until recently I had forgotten that I never shared any picture of Allison's "new" bedroom. Life gets crazy around here, especially on the weekends, and things I thought I did or planned to do somehow get overlooked. Anyway, a few asked me over the weekend if they could see what we did with Allie's room and so I am going to try and show you. Keep in mind that our house is really small and the bedrooms aren't that big so taking pictures is a little difficult, but I think you will be able to see the colors, the bedding, the chandelier, and the new bed in these. If you have anymore questions let me know and I will try and answer them for you. Here we go. This first picture shows the view from her bedroom door looking into her room. My favorite thing in her new room is the original artwork she painted to match. The piece in this photograph is super simple, but I love it. I think you can kind of see another of her painting in the background that she has sitting on an easel on the floor. The second picture shows some of the pieces on her wall. We found these accessories at Hobby Lobby and we loved them. The colors matched the plum color of her walls and her bedding but also added a green and orange to the mix so we picked up a couple more pillows to help tie them into her bedding. The word on this wall is faith. The opposite wall says believe. I love the feeling these words bring. Very inspirational and I hope they encourage Allie to dream big each night as she closes her eyes. The next photo give a close up view of the fabrics and pillows on her bed. Her old bed was a pink and white floral Pottery Barn quilt that I absolutely loved. Very girly. The new bed is made up rich velvet, a little bit of ivory colored lace, some silk and satin on the pillows and the bed skirt, and some beading. Allie chose the bedding herself and at first I didn't like it that much, but I ordered it for her birthday as a surprise and once the room was painted it was perfect. It is still very girly, just a grown up style of girly. I love the splash of lime green mixed in with the deep purples and mauve. The new bed is a treasure I found in Canton at first Mondays. I walked and walked the entire day looking for just the right bed and once I stumbled upon this one I knew it was the look I wanted for her room. It is an old iron bed that has been painted white. It is a perfect mix of old and new with its scratches and personality. We both love it. I picked up this night stand at Target after looking all throughout First Monday and not finding anything that would work. Its not my favorite piece because it just looks too new for my liking, but for now it is serving the purpose we need it too. The lamp is a wonderful piece I found on my trip to Canton and the jewelry box came with those pieces we found at Hobby Lobby. Again I love the mix of the purple and the green together. I added a couple of old glass knobs to the drawers to help tie it in with the knobs on her furniture. The next piece is the armour(sp?) that was originally built for our nurseries. It used to be whitewashed and it used to sit in Blake's nursery. It then became his sisters once she was born. I put a new coat of paint on it and added the glass hardware to it. I love this piece of furniture not only for its function but also for the sentimental feelings that come along with it. I thinks its beautiful and can't imagine it not ever being a part of the girls rooms. It was built by my stepfather who has gone on to heaven and it along with the next piece you will see are things he made for my children. He loved them very much. The dresser was also originally made to go is Blake's nursery. It became Allison's once she was born and Blake moved into his big boy room at the age of 2. I added a new coat of paint to it as well and the same glass hardware as I did on the other furniture. I love the old but new look it has and it definitely fits my motto of being well loved. The lamp on top has the same purple beading as the chandelier and the candle holder is actually one of those old sugar molds from Mexico that you find in Canton. The "bling" on the front(I know its hard to see) is actually an old broach that has been glued on and it is perfect for this room. The candles are a nice shade of green. Finally the chandelier. This is the piece she convinced me she needed to go in her new room. It was actually a birthday gift and she loves it. I hand beaded the splashes of purple to help it blend into the room a little better. It is the same beading that is on the lamp on top of her dresser. When it is turned on it casts the most beautiful shadows on the ceiling and the walls and if I were completely honest it is just as nice lying on her bed and looking up at the shadows as it was looking up at the puffy clouds that used to be there. I also love her windows, but it was difficult getting pictures of them. You can kind of see bits and pieces of the window dressings throughout the photographs. I love the fabric. It is crinkly and soft and the perfect shade to go with her sheets and pillows. I love the soft look it gave to the room. There is also a cream colored shag carpet rug that sits in front of her bed. It is soft and wonderful and helped to soften the look of her room. The walls are a beautiful shade of cream and plum and the floors are hardwood. Allison loves her new room and tells me she feels so grown up now. I love knowing that we were able to give her a place she can call her own and that the memories she makes inside of it will last a lifetime. "little" girl and then its off to college. Yikes! It has become my favorite part of the day. If you knew me before Ashley Kate you might be choking on that last sentence because I used to treasure sleep. It was one of my favorite things, but now its just so fun to wake up and begin our day that I lay there and wait for the applause to begin. Its the applause from inside the crib that announce she is awake and ready to play. Its the applause that tell us she has slept well, is feeling great, and just can't wait for one of us to walk over there and pick her up. Those applause have made ordinary, everyday mornings into good mornings in our home. Once her eyes have opened she rolls over and peeks out at us between the slats of her crib. I love to catch her doing this because it floods my heart with memories. Memories of her big brother who used to do the same. Memories of her big sister's brown eyes that could be caught doing it as well. I love knowing that her crib once held the tiny body of my son and the beautiful rolls and rolls of baby chub that her sister once owned. Dave built the crib when we were expecting Blake's arrival almost 13 years ago and it has always been one of my favorite pieces in our home. Its just right that Ashley Kate's sweet head rests in there. A few minutes after peeking through the slats you will see a hand come over the top and five tiny fingers begin to wave and tap. She's testing us now. Testing us to see we are awake enough to notice and if we will begin our "good mornings" yet. I like to just watch her fingers for a while. I stay as quiet as possible because I know that in just a few moments she will begin and once she does the smile that comes across my sleepy face draws me out of my warm bed to retrieve the precious gift that God blessed our home with. She claps and claps as I approach and her excitement grows with every step. Once I arrive above her and begin to greet her the smile that she shares is so full of JOY that I can't help but giggle out loud. She is so, sooo happy that the day has arrived. What will she get into today? What will we play? What is Blue up to? Where will we go? She has so much to do, to learn, to enjoy, to love. She just can't wait for it all to start, but first we must snuggle. Her little self into my chest. She fits so perfectly even at almost 3. Her legs are getting so long, but she draws them up into a little ball and lays her head on my shoulder. Her tiny hands reach around my neck and her fingers begin to pat my shoulder. Yep, she loves me and it feels SO good. She can't say it yet, but she sure can show it. I love that she lingers there for so long. Good mornings make for good days. They have never been sweeter. I'm so glad she's here to share them with. I love this bundle of baby girl so very much. We received a gift in the mail last week from a dear friend. A friend who I met while in Omaha on the very first day of our arrival when Ashley Kate was transplanted. A friend who became a friend because we were both living away from home, in the halls of the PICU, while our babies were recovering from transplant. Since that day we have both watched our children go through the ups and downs of transplant life. Sat by them night after night in hospital rooms, and celebrated each time they were released to return back to their own beds. The gift that our friends sent was a blessing. It arrived on just the right day and at just the right time in our journey of transplant. As I read through the pages of the story that we received I cried. Large, hot tears that streamed down my face as if there would be no end. I cried and I cried and I cried and then I smiled. I was crying not only because of the story, but because my friend showed me by the sending of this little book that she too could see the value in our Ashley Kate and that even though she was not developmentally where the other children are at this point she one day could be. It spoke volumes to the heart of this mommy who has been struggling of late. As much as I would like to forget and as much as I concentrate and give thanks for each of the good and positive moments in Ashley's life the words that were spoken do not disappear. I am haunted by the knowledge that the decision to give Ashley Kate new organs was not an easy one, but a decision that caused some to pause and think long and hard about her "worthiness" and about the quality of life she would have versus another child. There have been some hard days and some hard conversations between Dave and I late into the night as I try to come to grips with the facts of her development. I am hurting and I am struggling. I find myself wondering with each and every phone call from our teams of doctors if they second guess their decisions and if they think to themselves, "We told them so". Up until that day in that little office sitting around that table I had never considered the fact that Ash was going to be different and in my hurt and disbelief I made up my mind in that instant to prove them wrong. She was a worthy candidate and her life would be successful and have meaning and she WOULD BE JUST FINE. With each return and with each visit to the doctor's offices I have to repeat the same answers over and over again. No, sir she does not walk. No, sir she doesn't even crawl. No, mam she doesn't speak. Not even a word. No, mam she's not eating table foods. While our transplant friends all around us are talking in full sentences, running circles around the doctors and eating full plates of spaghetti our Ashley Kate seems to be stuck where she was, and actually a little more behind since she can no longer speak, than the day we flew to Omaha for our evaluation and then 20 days later our transplant. That is reality and this is what I am coming to understand was the concern of our surgeons and the team who evaluated our sweet Ashley. As I face this screen again after days of hiding from it and as my tears fill the keyboard our sweet Ashley lays snuggled under my comforter in the middle of my bed. I touch her little face and in her sleep she scrunches up her nose and smiles at my touch determined not to open those amazing eyes that sparkle with her zest for this life. As she drifts off to sleep each night across the room from me her tiny hands applaud the day that she spent here in her home where she is safe and loved and not judged by the amount of things that she can't yet do, but is celebrated by those of us who see what a miracle and an accomplishment each of her breaths truly are. She is happy and we are blessed. My only prayer, my only wish, my only "requirement" in her early days was that God would allow her to be happy and would allow her to give and receive love from me, from her Daddy, from Blake and from Allie. 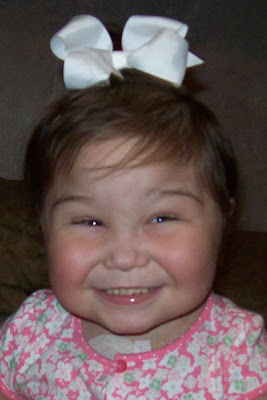 I never imagined that she would not speak, or walk or eat at 3 years old. My heart only knew that the tender hearts in our home desperately needed our baby to know how much she was wanted and loved. God answers prayers. In ways I don't always understand, but He does answer. Ashley Kate KNOWS she is loved. She LOVES us back, and SHE IS HAPPY. She is not aware that she is behind or different and she does not care. For that I am truly grateful. Even when my heart hurts over her differences it never fails to be grateful. As we sat across from each other in the restaurant this afternoon Dave jokingly said to me, "I thought we were going to lunch with the kids today?" "We did." I replied. "We just brought all their friends too. Their growing up, and lunch with their friends is a lot more fun than just having lunch with their mom and dad." And then he spoke some of the most beautiful words I have ever heard him say. "Growing up is allowed as long as they don't grow apart." Beautiful. Simply the most beautiful words I have ever heard coming from his father's heart. This is why I love him so much. Being a father to Blake, Allie and Ashley is the most important thing he has to do on his list, and knowing that he knows that touches me deeply. He is a dad first and everything else has to fall in behind that. Truly this man is the most amazing father I have ever seen. Ashley Kate is lucky girl to have the daddy she has, and by the sparkle that appears in her eyes each time he comes into the room I think she's already figured this out. It was one of the hardest tournament brackets we have ever played in and these guys were AMAZING! They lost both of the pool play games yesterday and were the 11th seed walking into this morning's games. They battled from 10am till 12 am and won their way into another title. After 4 games today, 3 of them back to back, this Tarheel team got to yell, "Happy Father's Day" to their dads with State Championship trophys in their hands. It was so FUN! Ash rebounded so well from her scare on Thursday and seems to be absolutely fine. No signs of any trouble and we are so, so grateful. She looked really good over the weekend and was pretty happy. A little tired, but happy. We will send labs early this week and continue to watch her closely since she'd had such a high fever last week. So far so good on all of her cultures. No news is always good news when waiting for growth. We walked in the door at 2:30 this morning and tucked all the children into their beds. They were snoring before I could turn out their lights. Dave was too. He spent the weekend at a conference and then came out to the ball field this afternoon to watch Blake play. To say he's a proud dad would be an understatement. Days like today don't happen everyday and it was pretty special to see it all unfold. Well, I'm pretty sleepy myself and snoring sounds like a good idea to me. Before the birth of Ashley Kate I never knew. I don't know how I failed to be aware, but I think until it hits close to home that its easy not to be. In the past few years I have had my eyes opened and not only that but my heart as well. I now know that children are born with disease. That NICUs exist all over the country and that for each and every NICU there exists a PICU just a floor or two away. Parents struggle to make ends meet while their very world lay fighting for life. Nurses are some of the most valuable people in this world. Kind words can make a difference on your toughest of days. Children die and families are left to try to keep breathing when their children no longer can. Life is precious. Life is fragile. Life is a gift. How did I not know this my first 30 years? When I hear that another child has passed the only thing that eases any of the sting in my heart is knowing that Jesus is there waiting on them. Knowing that the God who created them and loves them more than I can fathom is with them at the very instant that they take their last breath. It doesn't stop my tears from falling and my heart from grieving, but when I close my eyes I eventually find peace and rest in that knowledge. From moments to years old it doesn't matter. The pain of losing one of your children must be the greatest that exists. I feel as though I have stood on the edge of that cliff more times than I can count with our Ashley and the very feelings and groanings that it stirred within my heart are more than my words can describe, and yet I have never had to let go. Many of my friends have and as I watched from a distance it grieved me. Today the world said good bye to two precious little girls as Heaven said hello, and although I have never met their parents my heart grieves their loss because I can't imagine standing in the place that they have been brought to tonight. My heart is heavy with their burden and my eyes cry tears for them. My prayers are with them and I pray that they can feel that they are being lifted up. Our sweet Ashley Kate is with us and no matter how painful her life has been as we've watched her night after night in those NICU's and PICU's she is home now and home helps those memories to fade farther and farther away. Tonight I am aware. No longer am I blind to the blessing and the suffering that is intermingled in the lives of some of His creation. I wake each morning grateful for this life, for the life of my children, and each breath that our Ashley takes. I am aware that each moment our day is to be celebrated. Each blessing appreciated. Each gift opened with a grateful heart to have received it. I encourage you to soak it up. Your life is full of His promise. Your home, no matter what you struggle with, is bursting with blessing. Your children have been given to you specifically to parent and to love. Find joy in knowing that He trusted you with them and that He knows you were the one out of all of the "ones" He chose. I love knowing that! It could have been anyone, but its me that gets to know Blake, Allie, and Ashley Kate like no other. What joy that brings my heart. Does this kid look sick to you ? She's all smiles and and her eyes are twinkling again this morning so we're on our way back home. Dave thinks she just wanted to go for a drive last night and get out of the house. I guess I'm going to have get her out a little more often to try and avoid another midnight drive. This morning we are more than grateful that everyone believes this is just a normal kid kind of thing. We have to watch her temperature closely but we are hoping for clear culture results by Monday morning. What? Is that even possible? Dave and I discussed what should be done and in the end the rule is this: If you have a central line and you spike a fever then you must go to the hospital. So first we ran by the local hospital and had her examined by a friend of ours who happened to be the ER doc on tonight. She has an inflamed throat and left ear that looks like a culprit that could cause a fever. The vomiting? Anyone's best guess. He spoke with our doctor in Shreveport and they decided we would bring her over to keep an eye on her through the night. Have I ever told you guys how much I love our docs here? They do an amazing job taking care of Ashley and they are the nicest guys you will ever meet. God has really blessed us with them. So we sit in the PICU at Schumpert waiting our results. So far things are pointing the direction of an ear infection. That we can deal with. Dave deals with childhood ear infections on a daily basis in the office. She has already received an adjustment this evening and I have a suspicion that she will be getting another one before morning. The symptoms she presented with earlier this evening have all disappeared. She has no fever, no vomiting, no rash at this moment. Her heart rate has returned to a normal level, her blood pressure has too. We are sending cultures, doing chest x-rays, and the normal run of the mill tests to make sure nothing else is going on. We will run some IV fluids overnight and then if she does well and things look good by morning we will be discharged and free to go home before the children are even awake. Oh my goodness! this will be our shortest hospital stay ever! Our doctor plans on speaking with Omaha in the morning to see if they would like any additional tests to be run, but if not then we are out the door. So my heart has returned to its normal rhythm and my hands are no longer shaking. When will I ever get used to this life? If we had decided to wait it out at home sure enough she could have crashed in the middle of the night and we would have been in big trouble. Our theory with Ashley Kate is to check it out and hope for the best. It looks like we might actually end up with the "best" diagnosis possible this time. She's never had an ear infection so we get to add this to her list and the fact that it falls under normal kid stuff and not transplant is...well...normal. Blake and Allie will be thrilled to see her back home tomorrow. As will my two nieces who are staying with us. The panic in their little eyes was hard to see as they hugged us tight and told Ashley to get better. They've never been through anything like this and their little hearts are very concerned. They didn't like seeing Ashley's bags all packed and watching her back out of the drive way after dark. One of them asked me to "Please don't take her to the hospital again. Its really scary when you do that." Allie stood by Ashley's crib tonight as I packed her bag and told me with big tears in her eyes, "I'm really glad you and daddy are willing to do all of this for Ash. I mean, I'm glad you will go through all of this stuff for her. What if she didn't have you?" I had no idea she ever thought about things like that. Every once in a while I wonder if Blake and Al will ever resent their baby sister since we are gone with her so much, but then its moments like this one that reassure me how much they love this baby pickle and that their hearts were called just as ours were. How grateful I am to know they love her with such unconditional love. Blake's main concern tonight was rejection. Mine was too, and how he knew to be concerned about it is beyond me because I didn't discuss it with him. He wanted to know if I thought she was in rejection and I honestly couldn't tell him that I wasn't. I just told him that I hoped she wasn't and that maybe she just had a virus or a possible line infection. I didn't have any answers for him and I just told him we would know more by tomorrow and left it at that. He hugged me and kissed Ash's head and then went on to bed. At this point Ashley's daddy is lying next to her in her bed and they are ending the day just as it begun with giggles and applause. For this I am truly grateful even when it happens in the PICU. A smile on her face puts a smile on my heart. Thank you so much for being available to pray for us tonight. It brings such peace to my heart. Your prayers have pulled her through some really tough stuff and I am confident they can pull her through some minor things as well. Thank you . I continue to shake uncontrollably as things are quickly changing. In the last 30 minutes Ashley' body has broken out in a rash that looks strangely and eerily familiar to me. It is the same look as the one she broke out with last September when she went into rejection of her small bowel. She has also spiked a fever of 101.6 literally in the last 15 minutes. She is uncomfortable and thrashing around her crib. Dave is trying to speak to our local pediatrician and ask where he would like us to go and what he would like us to do. We more than likely are headed to the hospital, but I don't know where. Shreveport of Longview? If she is in rejection or suspected of rejection we can have her scoped in Shreveport and they can begin treating her with the high doses of steroids immediately. My hope, my prayer is that it all goes away immediately and our baby stays here in her home with her mommy and daddy, but its not looking good for us. Things change so quickly and its the change that throws me into a panic each and every time. Please pray. I woke this morning to the sound of Dave and Ashley Kate giggling next to me. He had picked her up from her crib and placed her in our bed on his way out the door to the office. She was smiling and clapping. Giggling with joy as the new day began. In all actuality I had been lying there listening to her giggles and applause from across the room as he showered. I'm not sure why she was so, so happy early this morning, but I wish for her sake it would have lasted. An hour or so later she began crying. Then screaming. Inconsolable. It lasted for the next three hours. No matter what I did she couldn't stop. I changed every dressing possible looking for the culprit and finally found it. She was having a breakdown over a breakdown. Underneath her ostomy appliance her little skin had broken down overnight and once she began to move around it must have caused her great pain. I cleaned it up and dressed it the best I could, but it didn't ease her discomfort. When the skin gives way underneath all that constant adhesive(she wears the appliance 24/7) it really gives way. I noticed that it was a little red yesterday and I treated it with skin barrier, but by this morning it had begun to bleed. It is raw underneath the adhesive and I have no choice but to place another appliance on top of it. This is another one of those areas of bowel transplant that I really and truly hate for her. The medications that she takes keep her from healing quickly. I have no idea how long her skin will ooze and bleed, but I will try my best to keep it as dry and clean as possible hoping for no infection. She is resting now after another 2 hours of continuous crying and screaming. I gave her a dose of Tylenol in hopes of helping her with her discomfort. We hate to give Tylenol because of its harmful effects on the liver. Especially since hers is transplanted. She was able to fall asleep, but I'm not sure how long it will last. I sent off more lab work this morning just to make sure nothing else is up, but I have not seen the results of it yet. I really and truly think our problem is the breakdown. How do I know? Because its 11pm and the house is still a buzz with activity. Doors are slamming. Children are running. The smell of popcorn is floating through the rooms. The girls are watching a movie and the boys are playing video games. When I say girls I mean all 4 of them( our Allison, her best friend and two of my nieces). When I say boys I mean all 3 of them(our Blake and his two Tarheel buddies). Thats a total of 7 children between the ages of 8 and 12 who are all LOVING the fact that its a Tuesday evening and they DON'T have to be in bed. Being a kid is SO great! I have a feeling that a few practical jokes are in store for the girls once they fall asleep. Call me crazy, but the boys came in from watching some of their friends win a city championship game tonight covered in shaving cream and I happened to see the leftover cans tucked into Blake's bat bag. They promised to only pick on their sisters, but somehow I don't think its going to matter. At some point tonight I'll be picking up the pieces and cleaning up shaving cream. Tomorrow we have plans of going to the pool and the pond for the day. Ashley Kate will be staying home and hanging out with her Nan while I take the kids for a day filled with summertime fun. That is if they can wake up in the morning! Ash had a good day. She is working really hard in her stander and in her gait trainer. We heard that Ash took two steps forward in it this afternoon while I was a the grocery store. I haven't seen her actually do it, but my nieces sure were excited to tell us about it. She even had a little spaghetti and some garlic bread for dinner tonight. When I say a little I mean very little, but the exciting thing is that she was interested in what we were eating and it wasn't baby food. It was real table food. Her labs came back with a "perfect" PT and INR level and her doctor was pleased. Her coumadin level is finally settling and her blood clotting is at the level they want it to be. She seems to be getting a little on the dry side again, but I am increasing her fluid intake tonight and will draw labs again on Thursday. Well, I'm not really sure. Last night I asked Blake to check on the baby for me and Dave said, "At what point does she stop being the baby?" I giggled to myself and thought "well...never". I mean, I know she's almost three, but Ash is the baby gherkin and I just don't think you can grow out of name like that. Ash is still the baby around this house. Its hard to think of her as anything else. She still acts like our baby. She still has to be carried around like our baby. She only eats baby food and the occasional cheez it. She still plays with all of her baby toys. The only thing that doesn't quite fit the definition of "baby" is her age. I mean, I guess if we get technical about things she qualifies as a toddler. Except that she doesn't toddle. We've kind of been blessed. I think anyway. Most babies grow up quickly. Too quickly for my taste. Before you know it they are squirming out of your arms in an effort to get up and go. Our Ashley Kate has been little forever. She doesn't try to get away from us. She still fits on my hip and on her daddy's chest. Her favorite place to be is cuddled up next to one of us. Growing up too fast? not in her case. She's still a baby in so many ways. Of course I would love to have her toddling and talking. Getting into Blake and Allie's things. Eating french fries and tasting everything on my plate. Sticky fingers to clean off the walls and things to fish out of the toilet, but I'm enjoying each day of her "babyhood" knowing that Blake and Allison's disappeared all to fast. Last night I held her tight and breathed in the baby shampoo smell in her hair. The skin on her hands was so baby soft and still smelled of lotion from her bath. She patted me on my shoulder and squeezed me tight as I placed a thousand tiny kisses on her cheeks. She grinned and showed me that row of teeth and scrunched up her tiny nose. She is so, so happy. I love that she knows happiness. I love that she feels loved. I love that she knows she is safe and that she is finally home. I love having this baby in my arms, in my home and in my heart. Still the baby? Forever I suppose and as far as this mommy's heart is concerned its ok with me for now. Oh my goodness sweet baby girl! You are so precious to my heart. Your eyes sparkle with personality and your smile absolutely warms your mommy's heart. Ashley Kate, your mommy loves you so deeply! What a joy you are. Its been 2 years since the day the courts said, "We Gotcha". The past 2 years have been some of the hardest but sweetest of our lives. You are a gift from our God and not a day goes by that I don't look at your face and fall in love all over again. When you smile your whole face lights up as does our entire house. I love every thing about your. Your eyes that sparkle with the life God has given you. Your tiny nose has got to be one of my favorite things in this world to kiss. Your cheeks run a close second. Your smile is this most wonderful thing I have ever seen and your tiny chin is so perfect. Ash, your hands are the sweetest and softest I have ever held. How I love it when you reach out to pat me with them. I love to nibble on your toes each time I reach into the crib to pick you up. I love every single inch of you(all 34 and 1/4!). Do you know how very loved you are? You are SO wanted and SO loved. We waited and waited wondering if God would bring you to us and He did. Not only did He bring you into this world and into our hearts, but He far surpassed our wildest imaginations when He made you. I had no idea I could love someone so much! Thank you for being who you are. Thank you for holding on through all those tough days. Thank you for being so tough and yet so very sweet. Thank you, thank you, thank you for teaching me how to grab to all that is important in this life. Today I look at you and I struggle to find the right words. Something wells up inside of me and I have no idea how to describe to you what it is that I am feeling. I'm just so grateful to be your mom. I am so blessed. Happy Gotcha day baby gherkin! Your mommy and daddy love you! Your big brother and big sister love you! Jesus loves you! Yesterday went better than I would have ever expected. Ash was almost pleasant while she was having the stander fitted to her. She only cried a small amount and then settled right into it. She played a while and seemed to enjoy her new perspective of the world. Then the hard to swallow part comes up. The moment that I stand outside of our world and peek into what is actually going on. This is our little girl being strapped into this device. She can't stand up on her own and she certainly doesn't walk. As proud as I am of each and every accomplishment that comes her way the fact remains that Ash is not normal and doesn't do the normal almost 3 year old things. Hard to swallow? Every once in a while. Painful realization? One that sneaks up on me every so often when I least expect to feels its sting. I didn't expect it yesterday and yet there it was. After we fit the stander to her our therapist mentioned to the equipment company representative that we would be needing to measure Ashley Kate for a wheel chair pretty soon. Sting. Instant tears that I was struggling to hide and hold back. A wheel chair? It seems, I don't know what it seems, it just doesn't seem to be what I expected to hear. There is nothing wrong with a chair its just that the pain that I felt pierce my heart at that moment came out of no where. No where! I sat her in a chair and watched as she was measured for seat depth, leg lengths, etc. I still tell myself that Ash is fine. She is going to be just fine. There is no disability here. Not with my child. Thats what I tell myself deep down inside. I don't know why? Its just admitting that there is a problem is like admitting to myself that my dreams for her to be normal some day have died, and that hurts. By the end of the measuring and the discussion it was decided that a wheel chair is not we needed to order. Ashley will learn to walk long before she would ever learn to propel her chair. We were discussing a chair because of her size and her age not because our therapist thinks she won't have the ability to walk, but because transporting her is becoming more and more difficult. We decided on a stroller. Not a normal stroller, but one that is custom fit to her measurements and her needs. It was almost ironic to be measuring her for it because just this weekend several of our friends asked us what we were going to do because Ash had almost outgrown her stroller(it happens to be the biggest you can buy in the stores). Ironic? not really. Just a God who knows what we need and when we need it. After therapy I went to have lunch with Dave and we discussed why this topic was so hard to swallow for us. Its not just me, its us. It hurts all of us to know that Ashley Kate is not walking. Dave, Trish, Blake, Allie, all of us. Every where we go, every doctors appointment, every everywhere we find ourselves being asked, "Is she walking yet?" It stings. I know its our reality, but its still that part of it that is hard to swallow. I think Dave said it best when I asked him if he was ready to have her in a wheelchair. After shaking his head no he replied, " It almost feels like we would be giving up or admitting that she won't walk. I'm not ready for that." I'm going to do my best to explain. When looking at Ashley Kate, if you didn't know her story, you might not realize that anything is different about her. I know her face is puffy and her eyes are a little crooked but outside of that when we are in public people don't know there is anything that different about our Ashley. She just looks like a toddler on my hip or on her daddy's lap. People approach our 2 year old and speak to her expecting her to speak back because they don't know she's different. The emotional explanation that would come each weekend as we pushed her through the ball park would be hard to swallow. NOTHING is wrong with the wheelchair, but the emotions it would cause at this time for Blake and Allie who so desperately want their friends to see Ash as "OK" or "normal" would be too much. The emotions it brings up, the thought of failing, it causes in her Daddy and I seem to be too great for us right now. Its just hard to swallow. I knew this day would come. I know it may still become Ashley Kate's reality, but my hope, my hearts desire, my dream for my daughter is that she will someday stand and walk on her own. It didn't happen for her at 1. It didn't happen for her at 2. It may not happen at 3, but I still hold on to the knowledge that there is no medical or physical explanation for why she can't. By all accounts she SHOULD walk someday. So for today it is a stroller and not a chair. I'm not sure what it will be tomorrow. Ash has been in her stander for about 4 hours so far. NOT all at once, but combined since it arrived yesterday morning. She goes from her standing frame over to the gait trainer and in just this short amount of time you can see what a difference is being made. She is moving all around the floor in the gait trainer. She only goes backwards, but the biggest change I see since yesterday is that once Ashley backs herself into a corner she starts to bounce up and down on her legs. Then when she is frustrated with not getting any where with her bouncing she STANDS up! On her own feet, using her own legs, lifts her bottom off of the seat of the gait trainer and tries to move it. This is bigger than HUGE! Its amazing! She is tired from all of her hard work. She is taking long, restful naps after each session in her stander. She is not able to sit when she gets tired. There is a little padded seat, but the position of her straps don't allow her to sit down. She watches an episode of Blue and then starts wear out. I imagine she will only get stronger and be able to stand for longer and longer periods of time. She is proud of herself. You can see it in her eyes. She applauds her own efforts and it makes my heart smile to see her sense of accomplishment. We are excited for her. Perhaps Blake will be right. He predicts a couple of months of this therapy and then she will be standing. I hope he's right. The first 24 hours conclude "No Growth"!!! Yeah. Only 48 more to go. When a fever show ups and there is a central line in place that is always the first suspicion. Ashley Kate's life has been very, very blessed when it comes to line infections. She has had a line for all but 2 months of her almost 72 and only ever had one line infection. In this area of her life we have been blown away by the protection of our God. Sometime last night, I'm not real sure of the time, when I got up to check on Ash she was covered. Not by her blankets but by sweat. Her fever broke. It never got very high. It was just enough to keep her feeling a little crummy, but nonetheless I am happy it is gone. She seems to be feeling much better today. She has been playing since early this morning and has already had a good nap. I'm still waiting on her lab results but as far as the culture is concerned no news is good news. Hopefully all is well and nothing is brewing. We have a few plans for the weekend. My nephew's wedding reception is on Saturday and my whole family will be attending. We are so excited for him and can't wait to see him and his new bride. My sisters and I have been planning this weekend for a while and it is our hope that Ash is well enough for us to travel there and take part in the celebration. In addition to his reception, the little girl who stole my brother's heart a year ago will be turning 1 this week and we can't wait to see her. She is walking/running all over and my heart is so excited about seeing her and her big brothers. Then to top it all off we will have a "Gotcha Day" celebration for our Ashley Kate. Saturday will mark the 2nd anniversary of that day and we have determined to never let it pass without a celebration. We are super excited that our whole family will be able to be a part of it this year. So if Ash can fight off whatever creeped into her system yesterday then we have some fun days in store for our entire family and nothing makes us happier than to have the opportunity to get together to laugh, play and celebrate. ...while I rocked our baby girl I found myself missing our little girl. The one who was once little enough to be snuggled up on my chest just as Ashley Kate is now. The one who is now too old for that little girls room and required a grown up, more sophisticated one. The one who is old enough to know that her hair WOULD look good if I would just allow her to cut it off and show me. Yeah, thats the little girl I am missing. Funny thing is that she is now too old to really be missing me as she goes out to breakfast, to the movies and shopping with her cousins who also were once little enough for me to cuddle up with as well. She had a whole five minutes of time to spare for me today as I told her how much I missed her and couldn't wait to see her. Today was an odd but nice kind of day for me. For some reason my heart kept becoming nostalgic for times past, but still so grateful for the moments I was witnessing. I told you it was odd. Blake and I spent the day taking care of Ash together. He loves to be the one "watching" her as I go about my daily chores. He scooped her up and took her to his room(one of her absolute favorite places in our home). She laid in the middle of his bed watching him clean(the kind of cleaning a 12 year old boy can do:) and was content just to be near him. She wasn't her usual silly self today, but a little more lethargic and restful. Still not feeling that good, but not that bad either. Anyway, I watched the two of them together and thought to myself how grown up my son is and how grown up our little pickle is becoming. Time is passing in our home. It is going quickly. When I see the children and who they are now I realize that our family is changing in ways I could have never imagined. We are on the verge of not having little children and a baby among us, but having young adults and a toddler in our midst. Blake is 12 years old now. A young man. So grown and mature for his age. His smile melts me daily and his wisdom in the situations I share with him humbles me. All of this and yet he is still kid enough to have huge dreams about baseball contracts,first cars, and high school championships won with all his Tarheel buddies. I love my son. My Allison, who now informs me she would like to be called Allie instead, has changed as well. Perfume, haircuts, manicures, and more. Bedrooms with velvet, satin and lace have replaced the pink and yellow walls and garden gates that once hid bunny faces and butterflies. Its funny because her bedroom is so grown up, but hidden on the shelves behind her door sit a collection of stuffed bears she can't bare to part with, her American girl doll whom she loves with all her heart, and a growing rock collection that she began at the age of 2. Grown up at 10 but yet still a little girl who loves to climb trees, play in the dirt and collect rocks. I love who she is right now, but still miss the long pony tail, dress up trunk and tea parties. Then there is our Ashley Kate. Our tiny baby who it seems we waited our whole married lives for. That frail little body who housed a spirit and a soul stronger than any I had ever met. Although her body is growing and changing in miraculous ways her mind is still so young. Do you realize that our baby will be 3 years old in just 2 months. The tears are welling up inside of me as I type that. My arms have goose bumps and God honestly and truly takes my breath away each time I allow myself to think about having her for 3 whole years. What a difference her little life has made in mine. On Saturday we will celebrate her "Gotcha Day" and thank God for giving her to us forever. Never again did I have to worry about anyone saying she wasn't mine. I knew it from the very first moment, but the law required mountains of paper work, court dates, home studies, and more. To be completely honest, I DON'T long for those early days in her life to return. The days where I longed to hold her, touch her and tell her how loved and wanted she was, but was held back because of the paperwork were the hardest of my life. How proud I am of her for holding on until we could get there. Each day we are given with her is a marker in my heart that God is not finished with our miracle baby and He has so much to still do in her life and her recovery. Whew! What a long day! The boys went all the way and won the final game with 9-5 win that ended around 9:30 last night. Ashley Kate came out of the RV for the final game with NO ponytail and NO hair bow! Her daddy was in charge of her between games and said he "forgot". Oh, well I was toooo tired to go back out and fix this little problem so THIS is what our pickle looked like for the night. If you know me, I'm mean really know me, then you KNOW this is unacceptable for one of my girls, but when the day began at 6:30am for the first game which started at 8 and didn't finish until 9:30pm you have to give up a few things. In this case it was a ponytail and hairbow. Anyway, it was a great weekend. We laughed a lot and cheered a lot and had a wonderful time. Ashley was extremely grumpy all day Saturday which made me suspicious that something might be up with her, but by evening she was her silly self so I thought perhaps I was just being paranoid. Sunday was a good day for. She felt really good and wasn't near as disagreeable. Then about 12:30 this morning she began throwing up in her car seat. She settled down and went back to sleep. We finally crawled into our beds at 1:30 this morning and she slept all night with no problems. At 9 this morning she threw up again. Around 9:45am she spiked a low fever and now I'm REALLY suspicious. I'm thinking a possible line infection may be brewing but won't be for sure until I can get orders to draw a culture and then we will have to wait up to 72 hours to be in the clear. I'm really praying that nothing is going on, but things don't seem right. She's just a little puny and not herself this morning. Your prayers for her would be greatly appreciated. Blake is his optimistic self(just like his dad) and says he thinks its really nothing. I talked to Allie(who is in Oklahoma until we pick her up this weekend) and she began chanting, "NO HOSPITAL, NO HOSPITAL" over and over. I hope she's right.